A virtuous young woman journeys to the land of the Dead to retrieve the still-beating heart of a king; a wily corpse-monster tricks his young captor into setting him free, the king falls under a curse that turns him into a cannibal; a shepherd who understands the speech of animals, saves a princess from certain death. 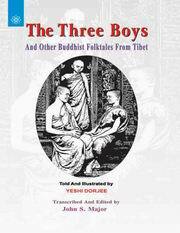 These are just a few of the wondrous tales that await readers of this collection of Tibetan Buddhist Folktales. Fifteen stories are told for modern readers in a vivid, accessible style that reflects a centuries-old tradition of story telling in the monasteries and marketplaces of Tibet. As a child growing up in a Buddhist monastery, Yeshi Dorjee would often coax the elderly lamas into telling him folktales. By turns thrilling, mysterious, clever, and often hilariously funny, the stories he narrates here also teach important lessons about mindfulness, compassion, and other key Buddhist principles. They will delight readers of all ages, scholars and students, Buddhists and non-Buddhists alike. Yeshi Dorjee was born in Bhutan in 1960. At the age of nine, he moved to Karnataka, India, and entered Gyudmed Tantric University, where he received a geshe ngarampa (doctorate) degree in 1995. He is currently teacher-in-residence at the Land of Compassion Buddha Center in West Covina, California.